Primarily designed for installation and repair of wire fencing but also useable as a come-along for other applications. 3/16″ aircraft grade galvanized steel cable. 2,000 lbs. capacity. 7′ Take-Up. Dual stamped metal ratchet wheels. High-strength electro-plated steel parts. 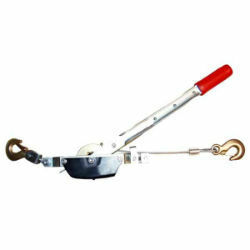 Drop forged steel slip hooks with safety latches. 15″ handle length.